1. OOh, I think there is a tingle in my fingers as I approach the first Ten on Tuesday of the new year. My heart is happy to be here. 2. I forgot how much fun it is to have blogging friends! 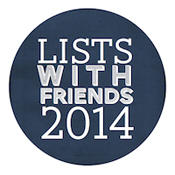 I have rejoined some of my old suziebeezieland blogging friends for a fun challenge in 2014 called List With Friends to document our life and adventures in list form this year. Challenge accepted. Thanks to Elizabeth for bringing us together again! 3. It has been really chilly in these parts the past few days. Now don't go rolling your eyes and say, "Geez, Susie, it's Ohio-- IN the WINTER!" I KNOW that, but truth be told, it's not usally THIS cold, like negative temps. with wind chills that can cause frostbite. So yea, it's kind of C-O-L-D.
4. It has been SO cold, that school districts in the area thought it safer to leave the kids at home rather than resume school after the holiday break. In short, the girls are on their 18th day of no-school today. 5. How are we spending our time, you ask? I'm a huge fan of playing card games (luckily, so are the girls! ), we bought new batteries for the Wii, making cards, avoiding laundry, reading great books, writing stories, eating Andy's amazing meals, planking, treadmilling it, some crafting, blading at the skating rink, and watching movies from the 90s. 6. I have about 92% of Christmas taken down and tucked away for the season. That last 8% requires some creative packing for some round ornaments. I feel lazy about the whole mess. 7. We did not send out Christmas cards in December and I was planning a nice snowy day family picture in January, but that hasn't happened yet. So... maybe Valentine's Day cards from the Sincocks? 8. I love brand new packs of writing cards. And I'm a little bit of a hoarder with them. Anyone want a card? I'll send you a snail mail note! 9. My first cold weather gloves from 2002 are about to tank this season. This is depressing and happiness all in one- I might be able to buy a pair that have those really cool conductive finger tips to use with my smartphone! 10. Each of the girls are involved with Girl Scouts this year which means that as of this Friday, I will have three (count them: 3!) daughters selling GS cookies. I'm not very excited and they are OVER the moon. Of course. And with that, happy Tuesday! Stay warm!